The use of modern technology in the manufacture of fishing gear left on the sidelines and such, it would seem, conservative type of fishing, as a float rod. On the other hand, takes a serious turn in the minds of fishermen. For most of them, especially abroad, are becoming more attractive technically challenging forms of fishing such as fly fishing, fishing with baitless lures, and float fishing rods – fishing, as it is now called, “long throw” (below will be applied the acronym DZ). Undoubtedly, fishing in which the distance to float much more than the length of the rod, appeared for a long time. Initially, the only reliable way of doing the DMZ was the way in which tooling was gradually carried away over that distance, where you can confidently catch cautious big fish. These were the technical capability of the gear. But was not on the technical idea of the most advanced anglers. In the end, the true birth of the tackle to CLE happened with the advent of spinning reels and with the use of artificial composite materials for the manufacture of fishing rods and other tackle items. The mass dissemination and improvement of this method of fishing was fishing. Currently, under “long-throw” (DMZ) refers to a method of fishing using float rod, wherein the length of the line from the rod to the float is several times the length of the rod. In its present form tackle to CLE consists of three main elements: rods with guides, spinning reel and accessories including fishing line placed on it by the float ogruzka, stoppers, dampers, hook and some equipment (leashes, buckles, beads, limiters, carbines, etc.). Consider all the elements of the gear, then move on to describe actual techniques of fishing on the DMZ. In tackles for DZ, as already mentioned, the rod, as in spinning, equipped with rings and coil. Here, however, the rod serves not only for throwing, of the bait and hooking fish, but also to control the movement of the snap-in is much smaller than in spinning, speed of retrieve and fish playing, using, in most cases, thin lines. The use of fine woods automatically leads to the fact that the need is a spinning reel, and the rod requires significantly longer and softer than regular spinning. Summing up, it should be concluded that the rod for DZ same way as for fly fishing, spinning or float tackle is deaf, is strictly specialized for this method of fishing unique to this class of rods characteristics. If we talk about long rods up to 3.5 m inconvenient, since in practice allow you to work solely with a sliding float, and difficult to manage tackle and towing. On the other hand, the rod is longer than 4.5 m are quite bulky, heavy, strongly Parasat the wind made it difficult for fast cutting. 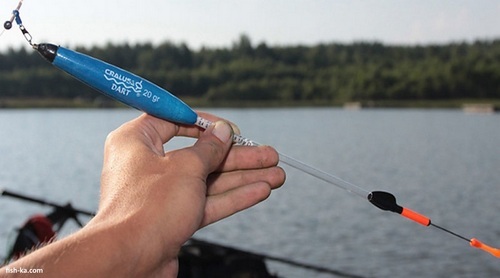 The casting distance is almost not increased, because it dramatically increases braking of fishing line in the rings. On the suitability of the rod for DZ can be judged by the rings with which it is equipped. Without going into the details of the design for the rings, we can say that the optimal number of 3.4-4.0 m rod should be between 12-16 pieces, including the Tulip. All rings must be mounted on high legs-holders, the length of which is equal to 1-2 diameters of the ring. Such frequent and high positioning of the rings allows you to more evenly distribute the load along the length of the rod and, most importantly, to distance the fishing line from the rod and reduce the beating of the fishing line when casting. The last imperative in the case of wet weather, when the rod is wet. The fact that wet rod fishing line in touch with him, as they say, “sticks” at the expense of forces of surface tension. Known cases when sticking the line load the rod when casting, especially heavy snap-ins have increased so much that the rod broke. The need for a large number of rings creates difficulties for designers in the manufacture of telescopic rods options. Therefore, in the vast majority of cool rods are for a DZ plug-in version number of bends not less than three. Also a distinctive feature of rod is the cork handle, equipped with a sliding cone reel seat. The ranks and class of the rod for DZ are divided generally into three main categories. This gradation is done on the test figure, which is nothing like the weight range of snap-in grams, which is possible without risk of damage to cast this rod. 20-65 g — hard, hard class. The rate for fishing rods is usually applied at its inboard knee by the manufacturer along with logo. In fishing activities for fishing most freshwater fish the most common rods that are included in the first and second groups. All rods for DZ usually have the classic parabolic action. In practice, this is reflected in the fact that a large part of the rod has a rigid structure, and the top (about a quarter of the length of the) soft. When playing big trophies the upper part of the rod (with the correct position of all gear) will bend so that it becomes a continuation of the line, and the whole load is distributed on the lower, more powerful part of the rod. In the most common fishing DZ of fish such as bream, roach, Chub, Podust, vimba and others, the vast majority of cases, used spinning reel, open spool. The main criterion when choosing a reel, of course, is its reliability. Picking up the coil, primarily to determine its size, which construction is directly linked to the diameter of the spool. From the point of view of amount of spool is usually enough capacity 180-200 meters fishing line diameter 0.15 mm, preference should be given to reels with large spools — less line twists. To reduce the strong twisting of the fishing line often need to use larger coils with the volume of the spool to 170 m fishing line with a diameter of 0.25 and even 0.30 mm. the Weight of such coils usually 300 g, and good samples — up to 230 g. the Next thing you need to pay attention to the presence of axial play between spool and spool body, it can be easily verified. Next, you should look into the passport of the coil and figure out what type of gearbox is used in its design. Undoubtedly, the most reliable and powerful is the worm gear, though less speed. The speed of winding fishing line is determined by the diameter of the spool and a gear ratio of the gearbox, which is also one of the passport data. To tackle the DMZ found use coil at which this parameter is in the range of from 1:4.5 to 1:7. Cool spools are manufactured using in their design one or several bearings, which increases durability and ease of operation. This information also contains the passport of the coil. A critical requirement for the coils for catching on a thin fishing line is the presence of smooth adjustment of friction brakes. The best should recognize the design of the brake is located on the spool and on the axis of the coil near the supporting bearing. When checking the brakes, preference should be given to the coils, which is between extreme positions of the controller the brake will be at least 3-5 full turns. The next thing you should pay attention to is the material of the roller line bale. Undoubtedly, the best rollers are made of ceramics. The spool also deserves attention. You need to look to the inner surfaces of the cheeks of the spool had no deformations, burrs, or cracks that could interfere with the free descent of the line. In recent years many companies along with production of special coils for long casting of steel to complete the usual spinning reels additional spools, which is marked “Long Cast”. These spool construction adapted to accommodate fishing line.